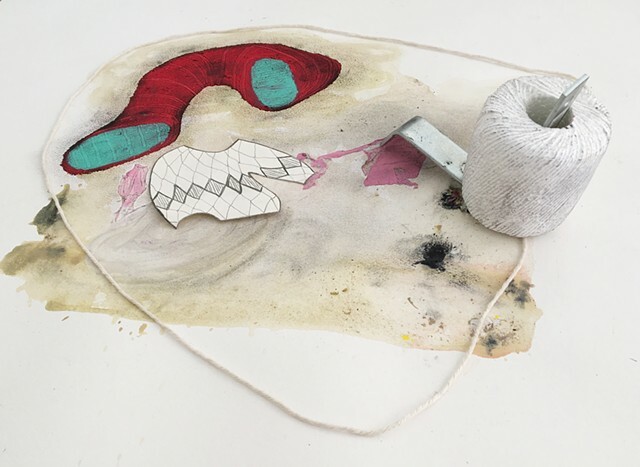 Emily Lindskoog’s most recent body of work includes unfixed two and three dimensional collages that are meant to feel malleable, in flux and infinitely re-arrangeable - a concept that stems from her life as a new mother to a very active and curious toddler. She follows the gaze of her son and re-imagines her surroundings as filled with a seemingly endless supply of things that need attention, examination, assembly, and a name. She allows herself to examine a cast off item with the fresh eyes of a child, asking, “What is this?” Her assembled compositions - with fragments of drawing, painting, sculpture and found materials - hover between abstraction and representation; cohesion and dispersion; chance and choice. Lindskoog - in attempt to make her studio practice more ecologically sustainable, and flexible enough to fit in small physical and temporary spaces - has been using found objects and materials that are on hand, including her own re-purposed artwork.